In 1972, a Las Vegas businessman named Len Frederick introduced a new kind of lunch to cash-strapped schools eager to see their cafeterias turn a profit. Instead of chicken or meatloaf, carrots and a carton of milk, students could eat hamburgers, hot dogs and French fries, and drink milkshakes or soda. All Frederick had to do to square his "combo meals" with national nutrition standards was fortify them with vitamins and add a sprinkle of wheat germ to the buns. Pickles counted as a required vegetable. 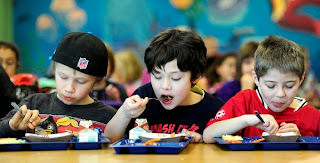 As historian Susan Levine recounts in her 2008 book "School Lunch Politics," Las Vegas students lined up eagerly for the new fast-food-style menu, and the schools made money. But in 1978, a food critic found that given the freedom to pick and choose, most children weren't getting the technically nutritious combo — they ended up with a lunch more like "two cinnamon buns and a Coke . . . four sugar cookies and a Sprite, or two bags of French fries and a milk shake." In hindsight, it's easy to see the Las Vegas innovation as a harbinger of today's fast-food-saturated environment and the nation's childhood obesity problem — now so severe that some doctors predict that today's kids will be the first in two centuries to have a lower life expectancy than their parents.